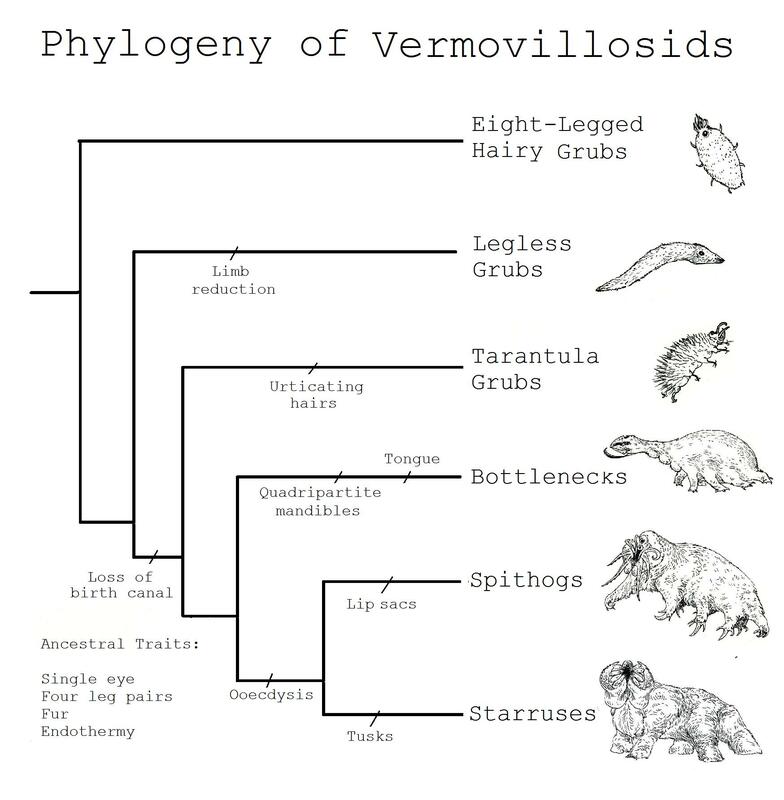 Eight-legged hairy grubs – The name vermovillosa, literally “wooly worm,” originally referred only to the hairy grubs common in Ilion’s soil. 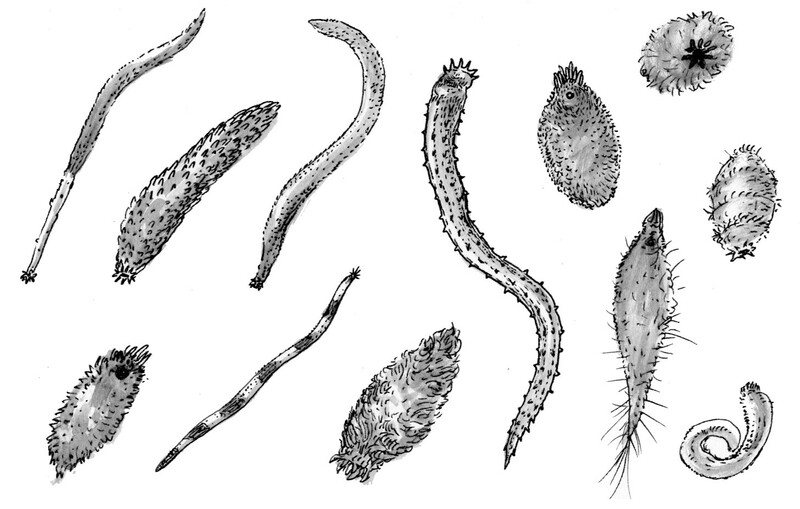 This group closely resembles the ancestor of all hairy grubs and furred megafauna. Legless grubs – Legless grubs fill many ecological roles, but decomposer is by far the most common of those. Like their limbed relatives, their kind are found across the planet. Legless grubs are the most basal vermovillosids to give birth through the skin instead of the mouth. This adaptation is believed to prevent choking during parturition, like a natural cesarean section. Tarantula grubs – Tarantula grubs have eight legs but that is not the reason for the name. The hair of many species is fitted with microscopic, mildly venomous barbs. Some grubs will rear back when threatened and fling their hair at attackers, a behavior also seen in tarantulas. Bottlenecks – The palps have fused into a quadripartite beak and a single olfactory appendage. Most bottlenecks are small, nimble predators that pluck prey animals out of holes and crevices. From here on, all species reproduce by ooecdysis. When the infant is shed from the neck, the skin comes with it along with a complex array of life support organs derived from the baby’s twin. The “egg” is capable of generating its own heat, reducing the need for intensive maternal care in cold climates. Spithogs – The group is defined by a pair of sacs at the base of the mouth, but the scientific name sacculaphora didn’t catch on to the general public. 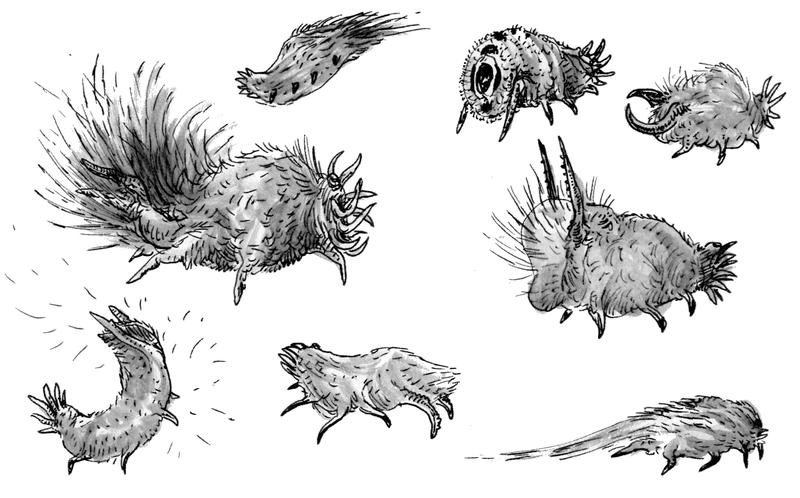 They are known colloquially as “spithogs” due to the ability of some species to forcefully eject venom from their sacs. The venom is produced by symbiotic blue mold. In most species the venom acts as a tranquilizer, inducing a state of torpor in prey animals, allowing them to be stored for later consumption. While most are resistant to their own toxin, some terminator inhabitants use the drug to hibernate through periods of food scarcity. Starruses – The two rear leg pairs have fused into a fluke. Ancestral starruses possess electrical sensors and six ears on their palps. The lower pair of palps have hardened into tusks. Starruses take on a variety of forms large and small, and have adapted well to all habitable climates. Some are hairless. 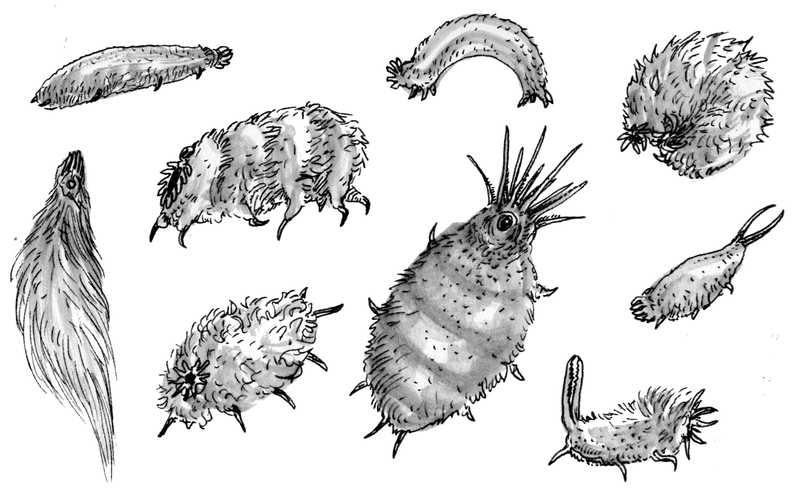 Eight-legged hairy grubs resemble the ancestral vermovillosid, which gave rise to the hairy grubs, starruses, bottlenecks, and spithogs. The legless grubs pictured here include small decomposers, archer mimics, and primary consumers. The specimen on the top right is a Polyxena wool-of-the-lamb. Polyxena archersnakes farm this species to line their burrows in the stormy climate of Ilion’s west terminator. “Our clothing would be more effective if it were airtight, but it’s not. Any breach in our protective layers becomes obvious the minute we step into the open air. These areas are the hardest to keep protected: the skin around our eyes, our hairlines, the place where our sleeves meet our gloves, the tips of our fingers, and our oxygen masks. Some of our less cold tolerant friends have taken to wrapping scarves around their heads, leaving only a slit to see through. Even the native wildlife can’t bear temperatures like this. On days like these, the firebears swallow their eggs and take to the ocean. Their outer fur layer is effectively watertight thanks to a system of interlocking barbs, almost like those on bird feathers or the black grasses that grow around here. The inner coat holds a layer of hot air next to the skin. This system works better underwater than in the wind, so they do their best to stay submerged. Starruses drop all their daily activities to huddle for warmth. They lack the near-perfect insulation that firebears enjoy, so heat conservation is a team effort. They don’t seem to notice or mind the other wildlife that joins their huddle. Even some of the archersnakes drop their predatory habits to join the party, although they do their best to remain hidden. Starruses will actively hunt and kill any snake that ventures near their herd. Because of this, most snakes retreat to their burrows whenever they can.